Jartis I like an illusion that can reset itself into something bigger (possibly). It's not really a Mistform creature though, and I really really wish it had flying. But I think the use of amplify in blue looks natural. gateways7 The extra trigger looks like fun to try and abuse (I'm thinking double strike and a "Sword of "), but it's not much of a mistform. Giving it an evasion assist ability was a good idea. kefke I like the gap fill of provoke and amplify. The cost is too low. Getting this as a 7/7 on turn three with an upside of provoke, it should cost more. I do like the weakening provoke mechanic, though it can be triggered multiple times in the same turn. Tesagk Sliver! This little buddy! A possible 6/6 on turn two is a lot. At common. I'm actually glad this one doesn't modify the hive. FLAREdirector Sliver! Defender is probably a good idea? I like the play between amplify and create, but creating a *free* sliver token is too good. Boogymanjunior Sliver! Oh... one that modifies slivers, sort of. =) I love the thought of a face-down sliver getting stuck that way if this creature dies. I might have derped the cost a bit, I'm not sure on your math, there. I guess it's maybe possible, if you drew a land for every turn, and by some miracle every other card in your hand was soldiers, and you only played one card other than basic lands over the course of your first three turns. That seems like a pretty big fringe case, though. viriss Thank you very much! I have to admit that I didn't really thought about that-but it's nice that you liked it! Due to the nature of the contest, I think I should explain my thought process. This was actually a fun one to design for. The entire Time Spiral block is one of my favourites, only just beat out by the Ice Age block due to greater nostalgia. I also have a fascination with the kind of distorted colour pie that Planar Chaos played with. Even so, I had some trouble thinking up what I wanted to do for a colour bleed...so I let my dice decide. Ultimately I ended up tossing out a lot of what my randomization came up with (a R/U sorcery), but it got me thinking in the right direction. Through a long process of six degrees of separation, I came up with the idea for "Red Overwhelming Splendor". I couldn't just shift the colour and call it good, though. That's not red's style. I knew the name of my new card first. Red is an aggressive colour. It wants to smash down any obstacles in its path. The idea of red using indiscriminate bombardment (orcs, goblins, and dwarves are all red creatures who use artillery weapons) to keep its opponents from acting felt very on-theme. For me, making sure the flavour fit was the most important part. I decided to lose the part about lowering power and toughness, though. Red's keeping on the pressure to prevent action, but not cowing the enemy into submission. I dropped the Curse subtype, since it didn't exist when Planar Chaos came out. Then I added my signature purple border to make it more obvious it's not a real card, because I'm cautious like that. Denying your opponent actions is normally pretty solidly exclusive to white, but rules setting is secondary in red. Rare as it is, red has even been known to edit cards - sometimes removing abilities - on occasion. Also, red has borrowed from white's playbook before, and isn't a stranger to off-color mass denial abilities either. All that aside, though, it still didn't feel perfectly red. Red is all about reckless action and short-term gains, though. 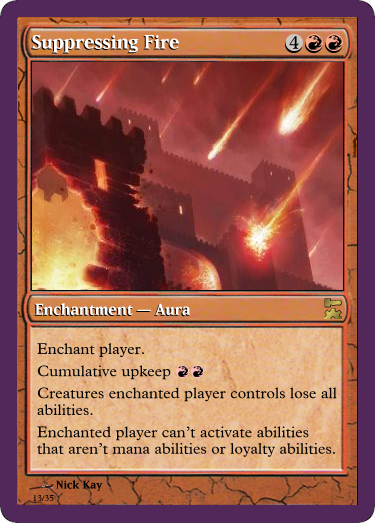 Add to that my intense dislike for the original Overwhelming Splendor, and sticking a cumulative upkeep on the card felt like the obvious choice. It makes sure there's a time limit to the effect, and means that red has to put all its eggs in one basket by mana starving itself to get the effect for any extended time. To finish things off, I gave my card a slightly lower CMC - still enough to not be used right away, but hopefully enough lower to not just be a strictly worse version of the original card. This is the colorshifted version of Deepglow Skate. EDIT: Wasn't happy with the flavor or the frame the previous entry used. This still colorshifts from Deepglow Skate but has better card art and an actual Planar Chaos frame. Yeah, just completely missed that. Heh. Creatures can’t attack you or a planeswalker you control unless their controller sacrifices a creature for each of those creatures. Black has gotten this effect exactly twice, and only once in mono-black, but it at least shows some precedence. Black's weaknesses are targeted artifact and enchantment removal, so this does neither of them. (Though I did consider making the effect "sacrifices a nonland permanent," "creature" felt way more black.) Also, yes, the wording does feel a bit gross with "creature" being in the sentence three times, but what can ya do? Whenever a creature deals combat damage to you or a Planeswalker you control, exile that creature. You gain 2 life for each creature you control with power 2 or lesser. I think this is in the limit of what a bend can do, but I see white getting access to card draw in an alternate color pie in the same way green does, tied to creatures. Also, I changed caring about power 4 or greater to power 2 or lesser as that is the way in wich white cares about the power of its own creatures. Time to judge for my first time! first being the double red Cumulative costs which basically forces you to play mono. This accentuates, in my opinion, the focus on red with a not-so-red effect too much. Second being that while you correctly dropped the Curse subtype, you didn't drop the loyalty ability preventing which also didn't exist back then. I understand that from today's point of view, loyalty abilities have more impact than curses and thus, omitting this would change the card more. But nevertheless I would weight the resulting damage to the task more than the gameplay change because it would still be a great card without. 2) that it doesn't really color bleed because green also doubles counters. Whether we look at all the cards which can double counters or only at those that existed by the time Planar Chaos was new, as even then doubling counters was equally distributed among blue and green, it doesn't really meet the criteria. 3) This card has so much free space which could and would be filled with flavour text (like it's original version). As this challenge also focuses on flavour, this is evaluated accordingly. viriss It's a okay card. 1) It doesn't really color bleed. The only bleed I could see would be that it doesn't grow in toughness, dipping in red. But green also has many creatures with more power than toughness, being the second most aggressive color. 2) the card on itself is not much. It has the same effect as Relentless Rats which was cool because it was a unique way of playing, but this card uses the same recipt without adding much new. 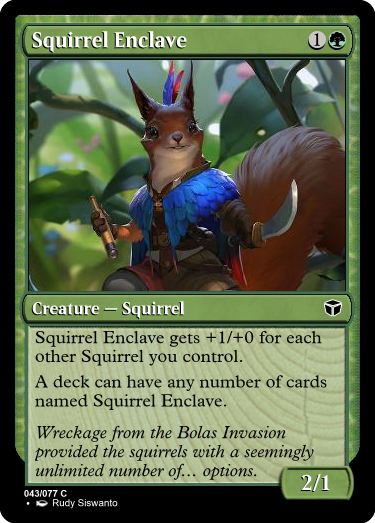 3) Flavour-wise it doesn't really fit because I don't think Dominaria was ever shown to be home to sapient squirrels. If we would say that well, they could exist on Dominaria, then we could also say this for each thing for each plane, thus watering down the task of fitting the flavour (plane) to nothingness. ly feeling very black. "Costs of War" doesn't really give a black feeling but okay. 1) The same point as for kefke: Planeswalkers didn't exist back then. 2) It is way too strong. For 4 mana getting this insane board control is just nuts. gluestick248 This effect is similar to Jartis' card but balanced. On the other hand, there is nothing color bleedy about it. Also, again, planeswalkers didn't exist back then. comes to mind as comparison, but Perplex has Transmute to counter these downsides. Also, the alternative for the player to pay X is basically pointless unless the targeted spell costs :0:. Otherwise, not only do they have not enough lands to tap, mana dorks too are unavailable as they must be tapped out already for the alternative to play out. Only mana artifacts, mana which tap for more than one mana and similar things can help, but this narrowness doesn't justify the whole alternative, in my opinion. It was a very close battle between yours and kefke's because the uniqueness was slightly in favour of his card. Ultimately however, yours was more elegant, also because of kefke's double red cumulative costs. Taking an already existing card, but not only colorshifting, but adding twists at exactly the right spots to create a shiny bridge between the body and blood of color, very nice. Runner-ups were kefke, then FLAREdirector. As I am very new to this (site and) challenge, I don't exactly know how much we should focus on the thought that we shall create cards for a set when it was considered new. On the one hand, many of you didn't seem to bother including planeswalkers in your cards, indicating that it's not a criteria. On the other hand, Kefke who seems to be an experienced member did include this as criteria in his design process while also failing to completely include it. Which indicates that he forgot it a little bit, meaning that everybody could have just forgot it. Whether it is a criteria we should meet or not, it wouldn't have had any important impact on my rating (especially because almost anyone failed at it in a similar way), but is there a official basis or can there be one? Boogymanjunior When you're the judge, you set the criteria. It's subjective. Do you want to focus more on how the card would have interacted with that set's environment, or with how good a "set inspired" modern card it can be? That's for you to judge. So in my opinion, if you want to dock those of us who didn't fully reflect the meta at the time the set was out, that's your right. Alright, so, this game started with original Innistrad and I started in Magic in the return to Innistrad (Eldritch Moon). As you may have guessed your next set is Eldritch Moon. As a restriction I ask you to make an Emrakul related card, be it an Emerge card, a flip card that flips into an Eldrazi or two meld cards. The only rule that really must be followed for this specific challenge is that you're judging based on overall flavor. As kefke said, the way in which you do that is very subjective. You can focus on story elements, particular set mechanics, or any combination therein. EDIT: I totally scrapped what I had before. Just wasn't feeling the design at aaaall. It happens. Whenever you tap a land for mana, add . Spend this mana only to cast a colorless spell, activate an ability of a colorless permanent, or pay a cost that contains . At the beginning of your end step, if you control three or more Eldrazi creatures, you may transform Moldgraf Ring. When this permanent transforms into Fengraf Defiler, reveal the top card of your library. You may have Fengraf Defiler deal damage to each player equal to the revealed card's converted mana cost. Put the revealed card into your graveyard. At the beginning of your end step, if you control exactly two Eldrazi creatures, you may transform Fengraf Defiler. I had a completely different idea until I saw this art. So, Emrakul-hosing it is. 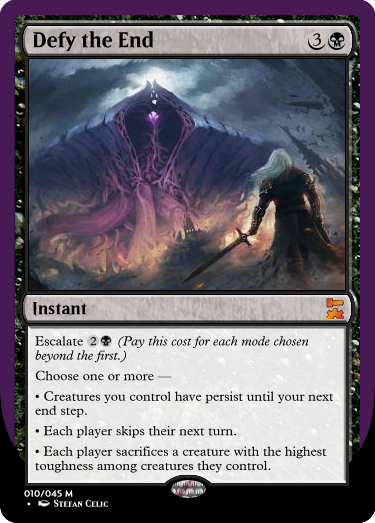 I wanted to make the escalate a little cheaper and put it as a legendary instant, but I'm already going slightly out-of-set with persist, without also reaching into the future again. kefke and Tesagk Thank you for the info. I just wanted to be clear to prevent treading on anyone's toes. Hope the judging was seen as fair by everyone. And just when you thought Lumberknot had finally found peace in its new form, Emrakul comes along and ruins everything. Now the souls of incautious trappers are turned into little Eldrazi. Works best with other emerge creatures but also within the overall theme of Innistrad, where things die all the time. Judging in 24/48 hours, get your last entries or edits in! Each player sacrifices a creature. 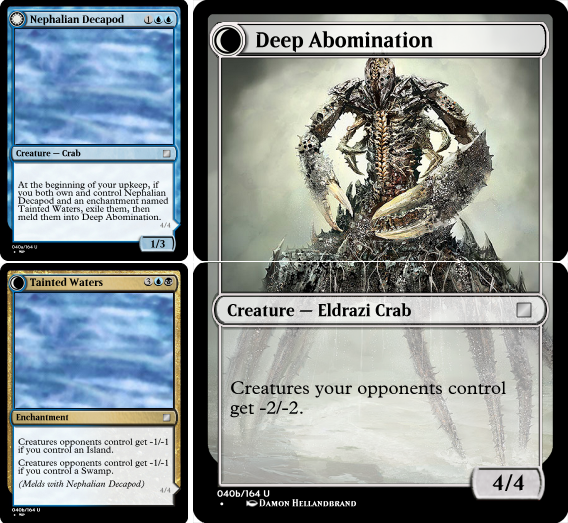 Each player who did so creates a 3/2 colorless Eldrazi Horror creature token. Oh shoot, I still need to do an entry. 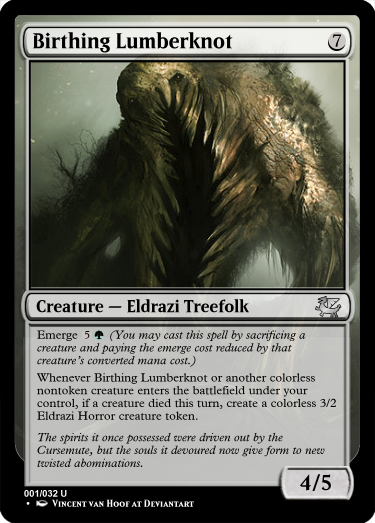 Whenever a permanent you control transforms into an Eldrazi or two cards you own meld into an Eldrazi, create a 3/2 colorless Eldrazi Horror creature token. Flo00 how does that work with Meld? Chose to give it one power to begin with to align it more to the distortion-feel Emrakul's beings spread. Boogymanjunior - Having trouble with the card creator? I notice you don't have the fonts installed. I'd also recommend getting the mainframe templates, so you can adjust the cutoff on the text field and avoid having words go behind the P/T box. Other than that, the card seems interesting. I think it would make more sense if the cost was , though, as opposed to two generic mana. Also, I'm actually not sure if emerge works with X costs the way you're wanting it to. I looked it up, and I still don't have an answer. I think it does, but the part of the rule that seems to cover it isn't entirely clear. So it should be fine, Boogymanjunior. If anything it might be too good. I'm gonna second kefke's proposal to cost this card at XCC. Technically, though, none of the printed creatures with emerge require colorless mana; they just have purely generic mana costs. Sounds like it's your call, boogyman.